It may look like a webcam from the 90s, but the Gear 360 is actually Samsung’s first stab at a 360-degree camera. Why has Samsung made a 360-degree camera, we hear you ask? Because to create a successful VR platform, users need the ability to create their own content - that’s where the Gear 360 comes in. The spherical camera was announced at MWC 2016, and features two 180-degree wide angle lenses that are automatically stitched together to create 360-degree video (or 30MP stills). These videos and stills can be viewed on a computer, smartphone, or a Gear VR headset. Do you need a Samsung Galaxy S7 and Gear VR headset use this camera? Not necessarily, but if your really want to make the most of the 360 you should buy into Samsung’s ecosystem. 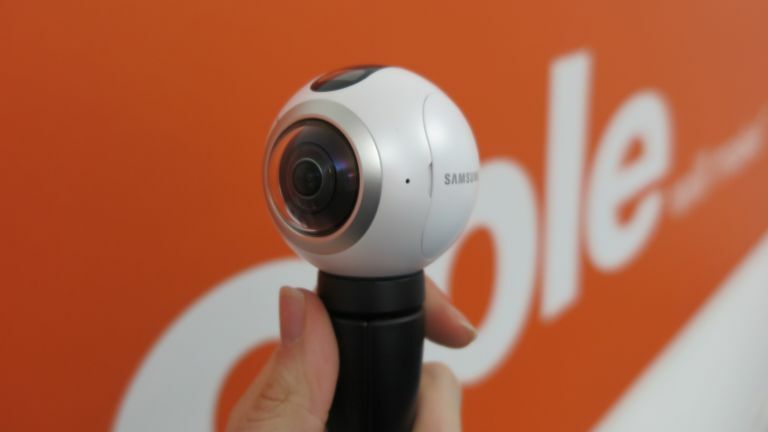 We think the Samsung Gear 360 looks great, it’s futuristic and sleek, and the spherical shape is extremely tactile. It’s designed to be action camera-esque - quite compact and simple to use. The Gear 360 measures 66.7 x 56.2 x 60 mm, and is reassuringly weighty at 153g. The included tripod acts as a natural handle, allowing you to securely hold the camera without blocking the lenses. It can be replaced with a full-sized tripod, selfie stick or anything that uses the standard 1/4 inch thread. The camera body features basic controls which allow you to adjust settings and start recordings for spur of the moment shots. These are intuitive but navigating the menu can be laborious - it’s much easier to use your smartphone if you have time. Sitting at the top of the Gear 360 is a record button and small monochrome display. This allows you set see basic shooting settings, and navigate the menu. On the side is a sealed door which covered the microSD card slot and removable battery - both very welcome inclusions. The camera is certified IP53, which means it’s water resistant but not waterproof - so you won’t be taking this scuba diving. The Samsung Gear 360 uses two 15MP sensors back-to-back to capture 360-degree 30MP stills, or 3840 x 1920 video. Obviously, these aren’t images that you’ll examine under a microscope for imperfections, but the quality from this small camera is impressive (as you’d expect from a smartphone maker renowned for its image quality). When viewed on a smartphone the images are sharp, vibrant and contrasty. The Gear 360 can handle different lighting situations very well, it’s best on a cloudy day, but poorly lit and uneven scenes are also impressive. The stitch lines where the two image meet is sometimes visible, but not jarringly so. Sealed inside the smooth dome is a DRIMe5s image processor, 1GB of RAM and, accelerometer. The 1350mAh battery can be removed, or charged via Micro USB. Once you've shot your extreme sports video/hip-hop promo/footage of your family having a row over breakfast, you can upload it to Samsung's own VR channel, or Youtube, or view it on your Galaxy phone, moving the image around with a touchscreen swipe. Let’s start with the app which allows you control the Gear 360 from your smartphone. It’s very well designed and intuitive to use. Unfortunately, it’s only available on Samsung Galaxy S7/S7 Edge, Galaxy S6/S6 Edge and the Note 5. If you don’t have one of those smartphones the camera comes bundled with PC editing software called Gear 360 Action Director. This is only available for Windows computers. So, if you own a Mac and iPhone/Non-Samsung Android you won’t be getting the full experience and it’ll make using and sharing images a lot harder. Everything the Gear 360 records is output in MP4 (H.265) for video and JPEG format for stills, so there’s no conversion needed before you upload it to Facebook or YouTube. The real fun, obviously, is when you bring in the Gear VR headset and watch your creations as virtual reality movies or stills. The latter gives a rather more weird, bullet-time/druggy effect, with the fish-eye lens distortion being more noticeable. It's a bit like a scene from a David Lynch film, when something extra odd or horrid is happening. With video, the fact that everything's moving makes the effect less jarring. Yes, we're dead impressed by Gear 360 as a piece of tech. As a consumer essential? Well… Not so much. Clearly most people won't want to spend that much cash to shoot VR footage that not many people (at this time, at any rate) will view. We do give full marks to Samsung for continuing to push VR in more affordable directions, though. We can also see this gaining traction with certain groups. Extreme sports enthusiasts, of course. And perhaps helmet-cam-toting urban cyclists will now be sharing footage of their high-tension interactions with burly taxi and van drivers in full, 360-degree VR, which I think we can all agree will be a lot of fun. Where this might really take off is in the area of low-cost advertising, though. Estate and letting agencies and those renting holiday accommodation already do photos of rooms; now they can give you a full VR tour. That's not very cool, maybe, but it is a genuine, non-gaming use for VR.